Background: The Killer Bee from Black Works studio is a smoke that I received as a gift from a fellow brother of the leaf. Admittedly it’s kind of cool to see a boutique blend like this that only comes in one single size – the corona extra. 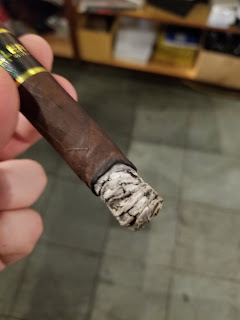 Appearance (0-20): The most striking thing about this stick, aside from the label, is the cap. 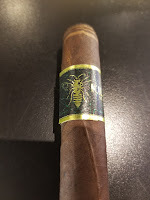 The deep Maduro wrapper is accented at the top with a swirl to give it the look of a bee. 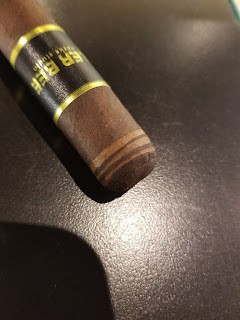 The bottom of the cigar features a closed foot, which is also not the typical that you would see of most other cigars. The band is also striking with a black backdrop, a green design across it, and gold embossed “KILLER BEE” and a large gold bee. Construction (0-20): With such a small stick, I would expect that the construction would be pretty good, and from the first feel, it was. No issues of under or over packing are evident, and the initial cut was pretty close to being clean. The draw both pre and post light were perfect, with a burn line that stayed consistently straight throughout. The ash held for about an inch and a half at a time but was a bit on the flakey side. Strength (0-20): Listed as medium to full, the Killer Bee does hit within that range. 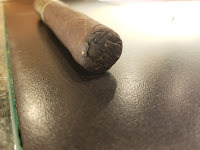 It actually begins a bit on the fuller side of things and tapers down slowly while smoking, ultimately resting in the medium or medium to full area. Flavor (0-20): Light up and you’re going to be hit with black pepper immediately. The intensity of it drops back a little, giving way to cedar and a creamy chocolate. That black pepper doesn’t completely disappear though, sticking around on the retro throughout. The thing that makes this cigar interesting and kind of unique though is the citrus notes that come through and give this a real vibrancy. 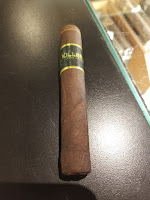 All of the flavors continue to be prominent at different points of the cigar, transitioning back and forth and giving a very nice smoking experience. Value (0-20): Size wise, I’m not really a fan of paying $7.50 for a corona, but this one makes it worth it. 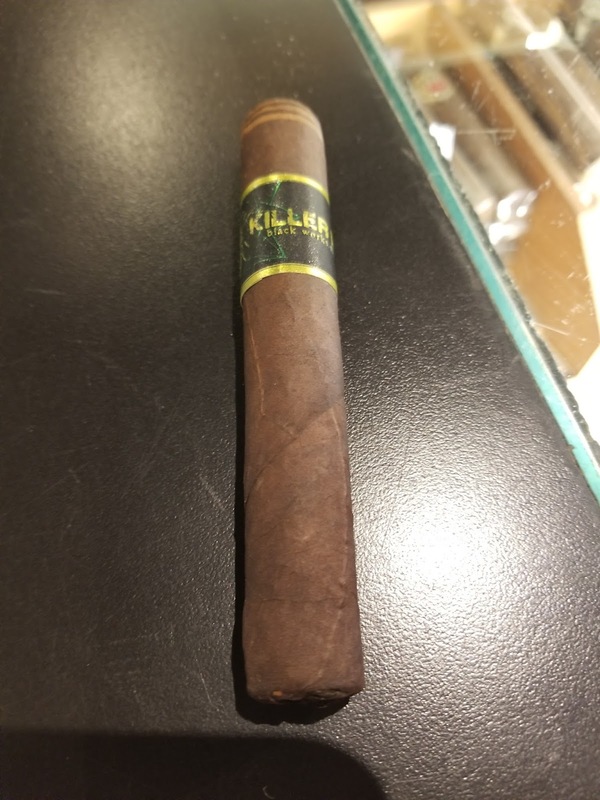 You are going to be paying a premium price for a premium smoke. Additional Notes: Paired with water. Overall (0-100): There is literally nothing in this smoke that I dislike. The presentation is one that stands out, construction is well above average, and the strength sticks where it should for a cigar of this caliber. 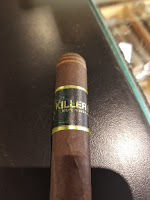 At $7.50, you may question if the corona extra size is really worth it – and once you hit the flavor profile with full force you will realize it absolutely is worth every penny. Pepper, cedar, chocolate, and citrus are the stars of the show but work so well together that you won’t be able to help being satisfied with how this tastes. A lot of thought and care went into this stick, and it comes through.